The Eddy is a neighborhood restaurant serving seasonal global cuisine driven by the Greenmarket fare and influenced by Chef Jeremy Salamon's Eastern European background and Hungarian heritage. The Eddy also offers wine list featuring classic and natural wines and original cocktails. The space was designed by the very talented and amiable Michael J. Groth. At the age of 24, Jeremy Salamon is the executive chef at the Eddy. If you think that’s young, the Florida native began his career at the age of 12 in a local country club peeling potatoes and making stocks after school. From there he worked his way up from apprentice to line cook. While attending a culinary magnet high school full time, and working in various South Florida restaurants, Jeremy competed in American Culinary Federation competitions—winning against professionals twice his age. At 18, Jeremy enrolled at the Culinary Institute of America and soon found work with chef Gabrielle Hamilton of the acclaimed Prune in Manhattan. Over the course of 5 years Jeremy went on to work for the likes of chefs Andrew Carmellini (Locanda Verde) and Jody Williams (Buvette / Via Carota). When he's not running to the farmer’s market or making pâté for the menu, he plays the ukulele and enjoys sourcing out the best breads in NYC. He hopes to open up his own business one day, exploring Eastern European cuisine. Robert Rugg-Hinds is originally from the Finger Lakes area. Having moved to New York a few years ago, he began work at The Eddy’s sister restaurant Wallflower, where he started to gain a deeper understanding and appreciation of cocktails through careful study and careful drinking. In May 2018, he took over the bar program at The Eddy--where he takes great pleasure in sharing his passion for drinks with co-workers and customers. 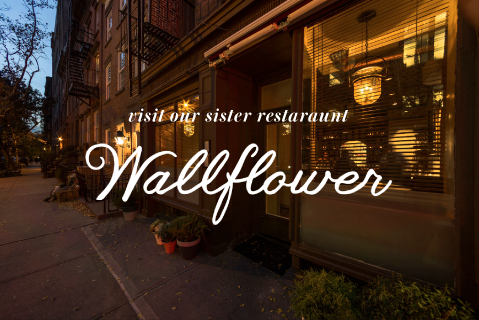 Jason is the owner of The Eddy and its sister restaurant Wallflower in the West Village. Originally from Toronto, Jason has lived in NYC since 2001. He has a management degree from the Institute of Culinary Education and an advanced certificate from the Wine & Spirit Education Trust. He has a remarkable team at both restaurants for which he is thankful for every day.